Barbara Sperrazza was a dietitian and diabetes educator who had the warmest smile and loved to help people. She lost her ability to read, write, speak and eventually swallow due to frontotemporal dementia, a progressive degenerative brain disease that strikes in the prime of life, typically between ages 45 and 60. Now, her husband and his brothers and sisters at the Fraternal Order of Eagles of Gainesville are fighting for a cure. They’ve donated $50,000 to UF’s Barbara’s Dream Fund for Frontotemporal Dementia. “This is the largest fundraiser we’ve had to date, and we’ll continue to do it,” said her husband, Charles Sperrazza. A Gainesville financial adviser, he helped found the local chapter of the Eagles in 1996. Over the years, the group has made the Evelyn F. and William L. McKnight Brain Institute of UF a top beneficiary of its charitable fundraising, with a focus on raising money for research in the areas of Parkinson’s disease and Alzheimer’s disease. More recently, they expanded their focus to include supporting research to find a cure for frontotemporal dementia, known as FTD. Barbara Sperrazza developed FTD at age 56 and died at age 64 in 2016. FTD is the second-most-frequent form of early-onset dementia, after Alzheimer’s disease. It results from progressive nerve cell loss in the frontal and anterior temporal lobes. 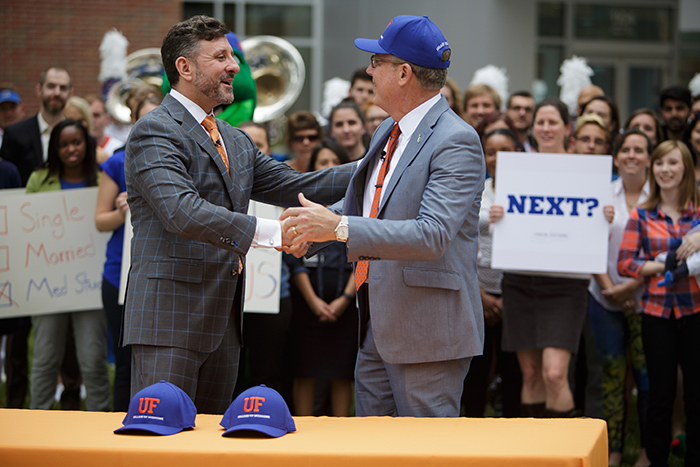 This story originally ran in the Summer 2018 issue of the Doctor Gator newsletter. Visit uff.ufl.edu/019659 to learn more about Barbara’s Dream Fund for Frontotemporal Dementia or to make a donation.